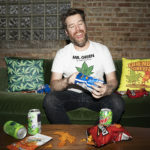 Meet the Artist Who Turns Tees into Quilts! Let’s get crafty! 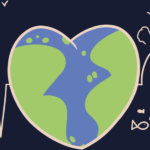 We’ve seen the Threadcommunity do some pretty amazing things; make WIP gifs of their work, create over 1,000 designs, Threadtwin as a family tradition. But one artist takes getting crafty to the next level by repurposing old tees and giving them new life as quilts! 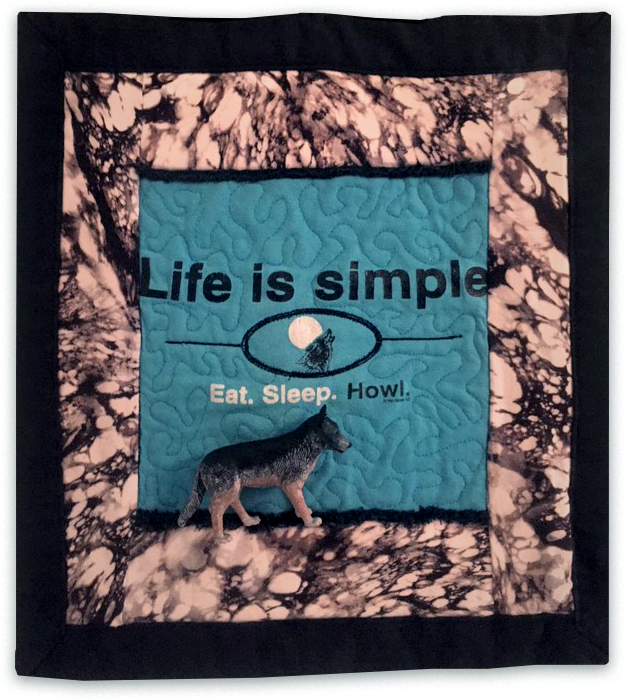 Quilt-maker extraordinaire Jeanine started Quiltatee as a passion project that fully embraces the “out with the old, in with the new (while still hanging onto the old! )” philosophy. 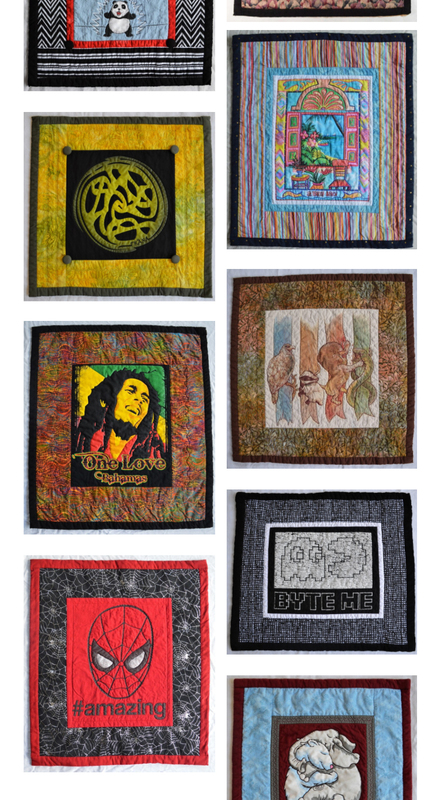 She creates quilts as both personal projects and as commissions for people who have old tees that they (or a loved one) don’t want to get rid of, love but can’t wear anymore, or that they want to give as clever gifts. We talked to Jeanine about a few of the Threadless quilts she’s made (yay! 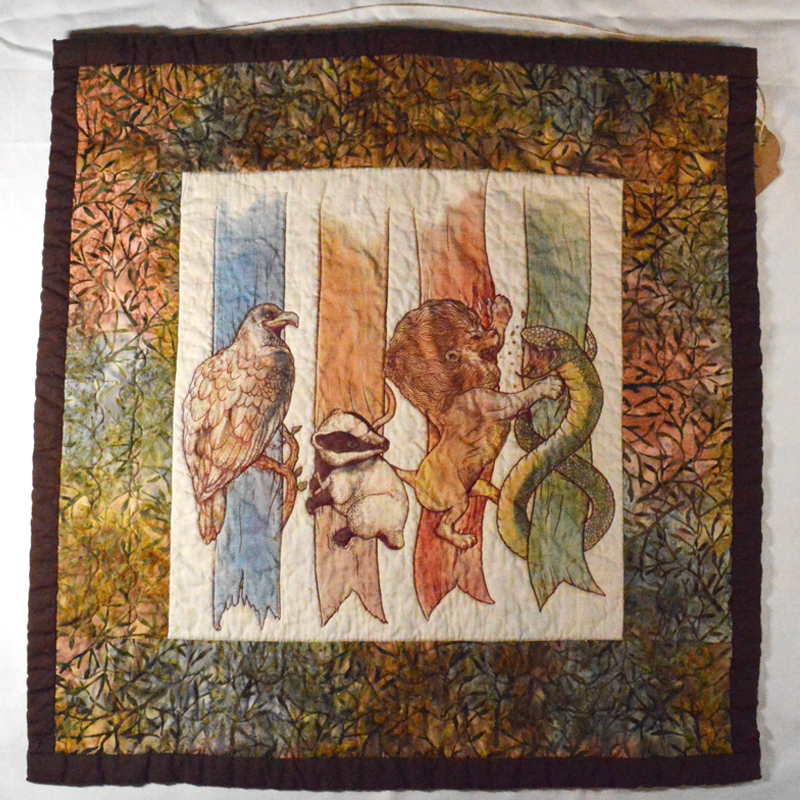 ), about her process, and about some of her personal favorite quilts! Check out her story and her work below! I recently retired as a Vision Rehabilitation Teacher, working with adults who are visually impaired or blind. It was a very rewarding job, but could also be very stressful. I decided to devote my energies full time to my passion: sewing and quilting. 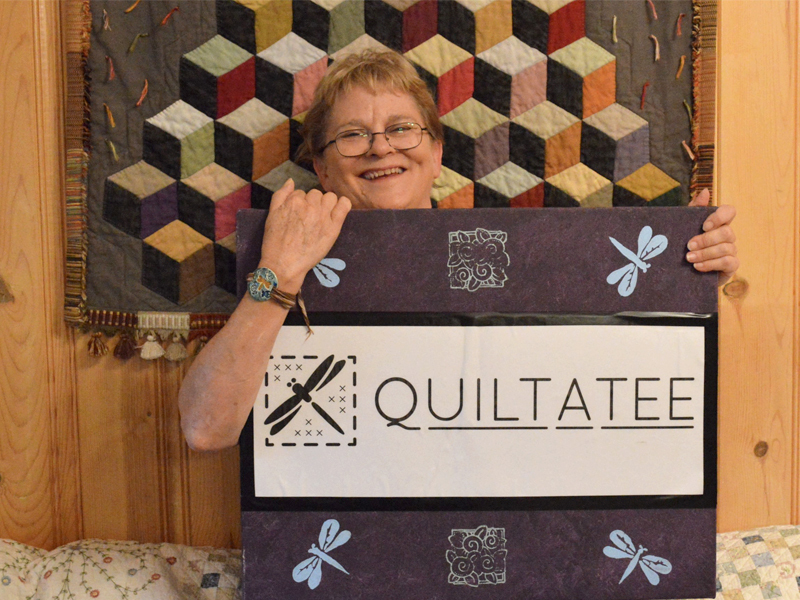 How did Quiltatee get started? I came across one of my daughter’s t-shirts that I had set aside with the idea of doing something with it one day. She loved wolves when she was younger and wore her wolf tee for years. I turned it into my first Quiltatee and gave it to her for Christmas last year. I was so pleased with the finished result that I started looking for more t-shirts to transform. I started sewing when I was a teenager and started quilting twenty years ago. I really enjoy repurposing materials (and fabric). Most of the large quilts I made utilize repurposed fabric, mainly fabric from upholstery sample books I purchased at thrift stores. That’s one more thing I love about making Quiltatees: I am repurposing t-shirts that deserve to be admired for years after they are no longer worn, giving new life to used tees. What’s your process for coming up with a quilt design? I was a picture framer for several years before becoming a Vision Rehab Teacher. Making Quiltatees is a similar process; I study the artwork on the t-shirt and imagine what colors and elements will highlight the design. I pick out material from my stash, usually looking for two complimentary colors and styles, similar to picking out inner and outer mats for framing a picture. And the outer border of the Quiltatee is like the frame. I had no idea until I started making Quiltatees how much fabulous contemporary art is on t-shirts. 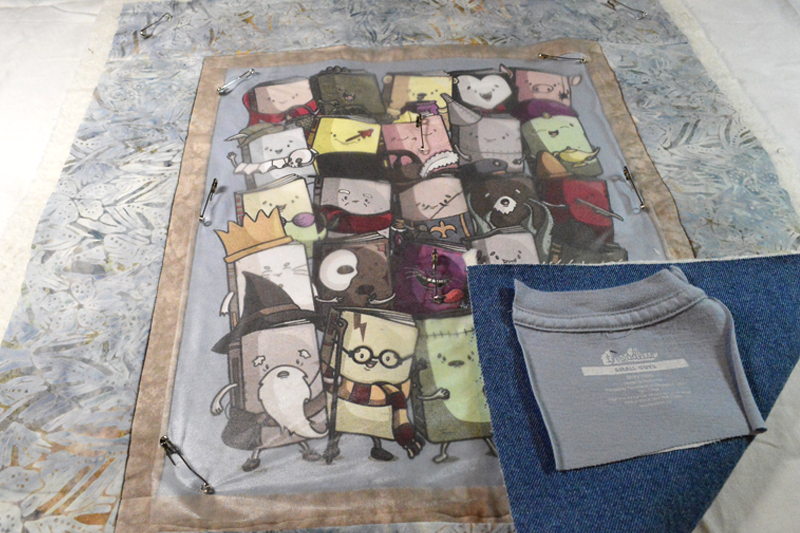 So far, I have three Threadless tees done and another in process. 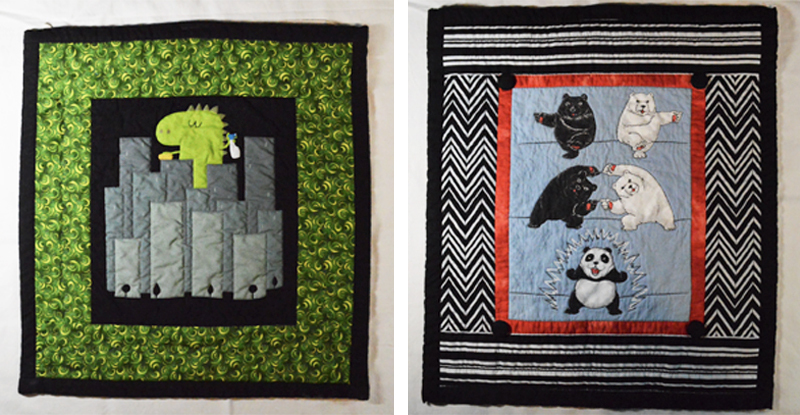 I quilted: “Ultimate Fusion!“, “Clean Monster”, and “House Brawl” and have started “Storytellers”. All these are delightfully whimsical and very creative. Threadless tees are some of my favorites because the artwork is so creative and whimsical. My main goal with making Quiltatees is to have fun, so I really like using fun artwork. One of my other goals is to honor the wonderful artists who share their art on t-shirts. I really like the fact that older Threadless tees have the artist’s name on the label. I attach the labels onto the back of the quilt to acknowledge the artist and/or the company the design came from. “House Brawl” by Alex Solis & Alice X. Zhang. You’ve made a ton of quilts! What are some of your favorites? It’s so hard to choose since it really is a labor of love making each one. But my favorites are the ones in which the design is outstanding, creative, whimsical, or funny. So the Threadless ones are among my favorites. The Prana Quiltatee is also one of my favorites because of its simplicity, the fact that it has dragonflies in the fabric, and the fact that I like to think in terms of everything as energy. How do you actually go about making a full quilt? Besides my commissioned pieces, I have been busy accumulating t-shirts from thrift stores so I now have quite a stash to choose from. I pick one out, cut it larger than the finished size, and use stabilizer for the jersey fabric. I usually have the perfect fabric choices on-hand but if not, I take the design to a fabric store to select matching fabric colors and designs. I can usually use “fat quarters” in the Quiltatee because they are not that large. I cut and piece the “inner mat” and then the “outer mat” onto the tee design to create a quilt top. I then add batting and a backing fabric sized for my quilt top. Once these are pinned together, I begin quilting. That’s one more thing I love about making Quiltatees: I am repurposing t-shirts that deserve to be admired for years after they are no longer worn, giving new life to used tees. As a Vision Rehab Teacher, I fully appreciate artwork that is tactual, that can be appreciated by touch as well as sight; that’s why I stitch around the figures and other elements in the design. 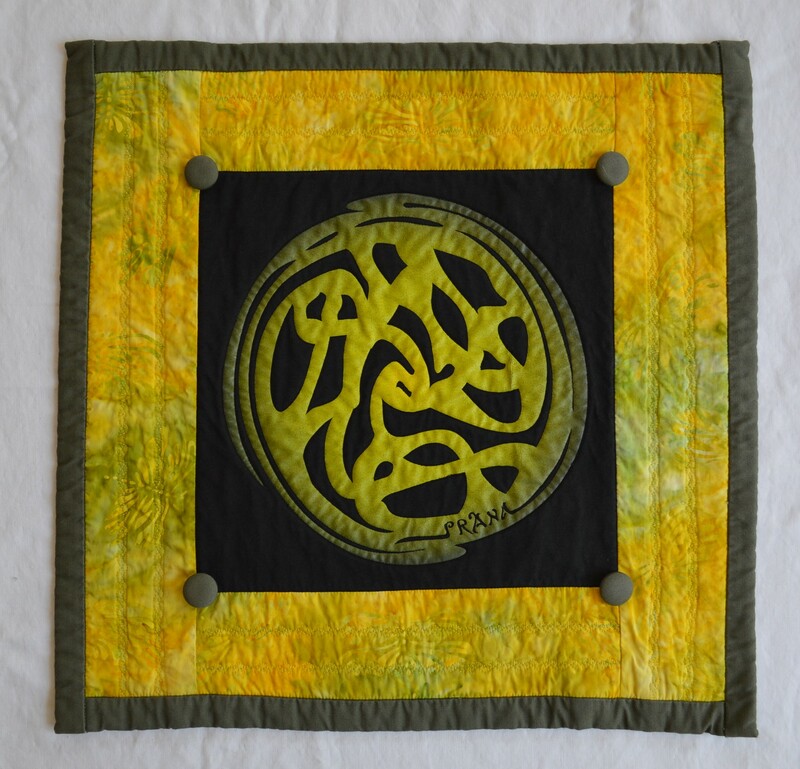 Then other quilting stitches are used in and around the design, based on the artwork and overall effect I am looking for to compliment the art. How long do your quilts take to make? One of the reasons I really love making Quiltatees is because I can complete one in a day or two. It’s really nice compared to making a large quilt, which can take weeks or months! I get the satisfaction of completing something that is totally unique in a short amount of time. 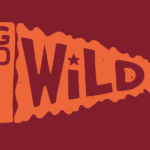 What quilt have you had the most fun making (so far)? I love the challenges in making each Quiltatees unique. It may sound silly, but I fall in love with every one of my Quiltatees (after the first couple of practice ones). I love doing commissioned pieces as well because of the positive feedback from customers and the satisfaction in honoring their personal tee and turning it into something that will be enjoyed and displayed for many, many years. 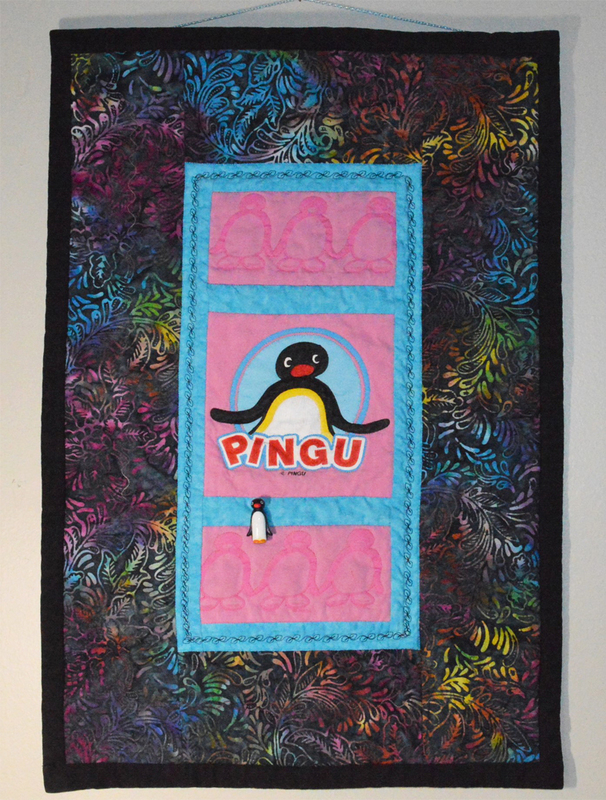 Pingu: this uses a t-shirt my brother picked up in Japan for my daughter, who loved Pingu (the Claymation series). She wore it for years, then we passed it on to my great niece, who then wore it for years. It had been loved so much that the design was halfway peeled off. 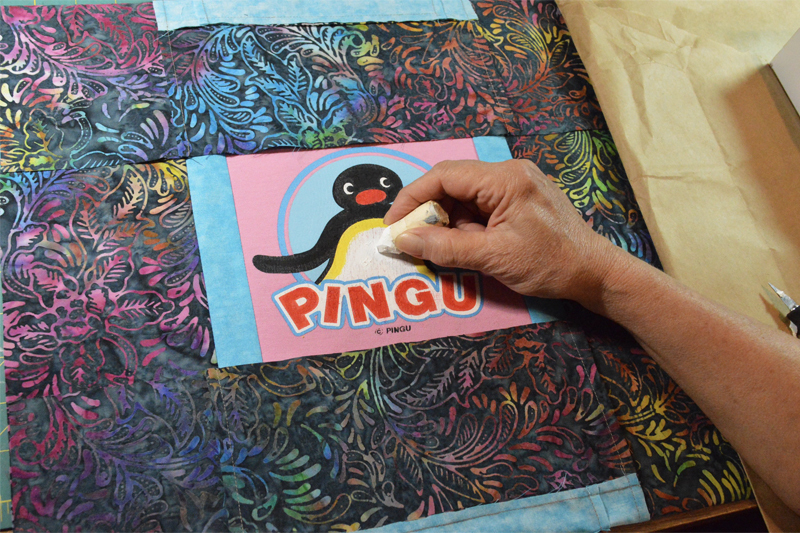 I was able to restore the image using oil-based fabric paint and made it into a Quiltatee as a family heirloom. 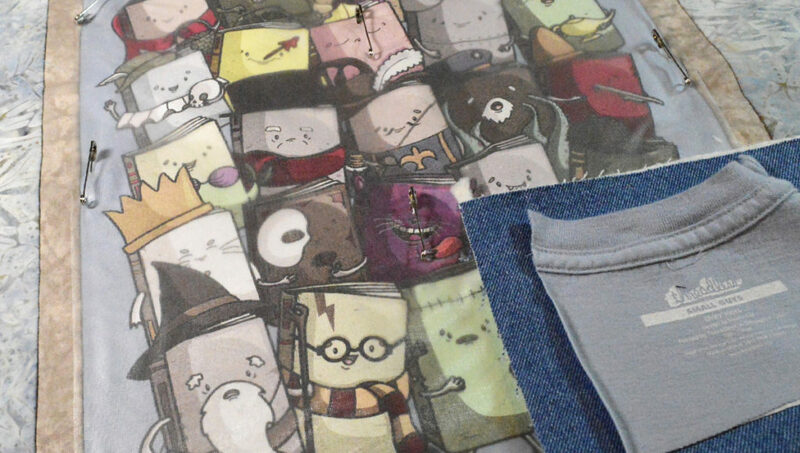 The shirt had the Pingu figure outlines across the bottom so I incorporated these into the Quiltatee as an added effect. I happened to have saved the little figurine, that was a pencil topper, and sewed it on as an embellishment. 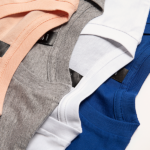 find your own awesome tees here! Posted in Blog, Fun Stuff and tagged DIY, quilt making, Quiltatee, sewing, t-shirt quilts, tee quilts. Bookmark the permalink.